You are here: Home / About this Blog and Blogging in General / Authored by H / Where’s My Brick? I (H) am on the phone this afternoon talking with my friend and all of a sudden she turns into a raving lunatic. I have to start this narrative by telling you that my friend A2 is the perfect example of Southern Belle (with that cute slow southern drawl and everything). I saw her for the first time yesterday without makeup, and it was only because I shamed her into it! She usually has her hair in some pretty up-do and make-up perfect and clothing is pristine in classic styles. All the while toting around her 8-month-old son. We had been talking for about 15 minutes about several topics including: her pretty church dress she was wearing, dogs, neighbors, her kid, my kids and what time she is going to drop off her son tomorrow so she can run up to the base. All of a sudden she says “What do you kill a snake with?” I reply a “A shovel, but around here the only snakes we see are Garter Snakes. They are harmless.” At this point I hear her rummaging through her garage saying “I only have this snow shovel, it’s plastic. It won’t work. Oh… I saw a bowling ball in here yesterday, I can mash him with that! Where is that stupid thing? You know I can’t find it now! I have this hand trowel, but I don’t want to get that close. Ohhhhhh! Here’s a loose brick I can bash him with! Alright H. I gotta go now. 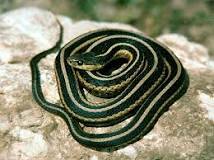 I’m gonna kill this snake.” With that parting comment she hung up. And I thought to myself, well that was out of character for her! A little bit later she texted me back and informs me that “the snake knew she was coming for him and he hid. But she will be ready with her brick!” I texted back “It was just a helpless Gartner Snake.” she made a comment “I just don’t like them crawly things”. So here I am posting about it. I keep thinking about A2 in her church dress (that I think looks like the one pictured below) chasing a snake around her yard. And the more I think about it, the more I realize there are things that push each one of our buttons (S stealing your phrase). Mildew in the shower for me. Once I see it my bathroom turns into a caustic zone. out comes the bleach, scrubber and gloves. I did it at 11:30 pm two nights ago.